Oracle Far Sync is an Oracle 12c new feature for Oracle Data Guard. This feature is meant to resolve the performance problems induced by network latency when you maintain a standby database geographically distant of the primary database. In this type of situation you sometimes have to make a compromise between performance and data loss. The Far Sync feature offer you both. How does Far Sync works ? The principe is fairly simple, the Far Sync instance receive data synchronously from the primary database and then forward it asynchronously to up de 29 remote destinations. The far sync database is not a standard database, it only contains a specific controlfile, a spfile and standby redologs. This database must be placed near the primary database to guarantee an optimal network latency during synchronous replication. But be careful, don’t place this database on the same geographical place than the primary, because if your primary database experiences a geographical disaster, your Far Sync will be impacted too, and some data could be lost. In case of an outage on the primary database, the standard failover procedure applies and the far sync instance guarantee that no data is lost during the failover. My standby is ready, Next we will create the Far Sync Instance. We need to create a specific controlfile and a pfile from our primary database. SQL> ALTER DATABASE CREATE FAR SYNC INSTANCE CONTROLFILE AS '/u01/app/oracle/control01.ctl'; Database altered. then create a pfile from the primary spfile that we will use for the Far Sync instance. SQL> create pfile='/u01/app/oracle/initDB12CE.ora' from spfile; File created. After that, we need to copy those files to the Far Sync server. Our Far Sync instance is now ready for the configuration through Data Guard Broker. I changed the db_unique_name of all my three databases. SQL> alter system set db_unique_name='DB12C_PRIM' scope=spfile; System altered. SQL> alter system set db_unique_name='DB12C_FS' scope=spfile; System altered. SQL> alter system set db_unique_name='DB12C_STBY' scope=spfile; System altered. SQL> alter system set dg_broker_start=true; System altered. Configuration "dgb_db12c" created with primary database "db12c_prim"
Now far sync is enabled, we changed the redo configuration to indicate to the primary database that redo should be forwarded to the Far Sync instance using synch mode. We edited the Far Sync configuration to indicate that redo will be received from the primary database and then forwarded to the standby database. That’s it, configuration is done. Here are the LOG_ARCHIVE_DEST_n parameters from each database. Far Sync is a very good solution when your standby geographically distant from your primary and you can’t choose the MaxAvailaibility protection mode for performance reasons. 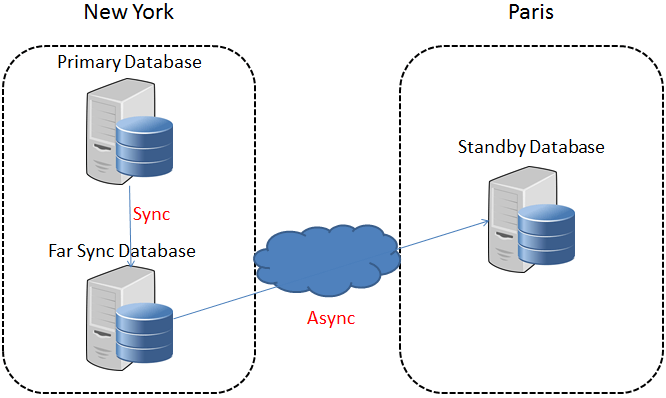 It is also possible with this solution to choose an alternate archive destination for primary database in the event of a failure on Far Sync instance, in this case the primary database will send the data directly to the standby database asynchronously.